The superyacht segment - dealing with boats over 24 metres - has also seen the open lines getting into their stride, with proposals from very heterogeneous yards. Azimut has developed a design that is outstanding, especially for original aesthetic solutions and choices that translate into real liveability of highly different vessels. On this occasion we wish to offer our readers a series of data recorded aboard two different examples of the 86S, one with Arneson Drive Twin Disc surface piercing propellers and the other with waterjet propulsion produced by Hamilton. Both vessels are powered by two MTU 16V2000M91 engines, modern propulsors with common rail feed and three turbo-compressors capable of delivering 2.000 HP each. Construction material: GRP and carbon fibre. 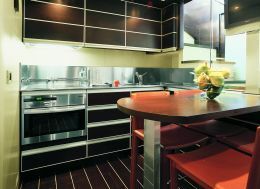 For further details and information contact Azimut Benetti SpA, Via M. Luther King 9-11, 10051 Avigliana (TO), Italy; tel. 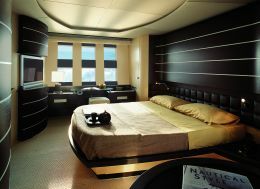 +39 011 93161; fax +39 011 9367270; website www.azimutyachts.net. We compared performances of these two versions of the same model, sailing in adverse sea conditions, and we carried out manoeuvres in restricted waters in order to get a clear picture of the seaworthiness of this yacht with its different transmissions. The results of our survey may be seen in the tables and graphs published together with this article. As regards our considerations, we say in advance that they are enthusiastic, and we shall explain why. Firstly, performance: in both cases we achieved a speed of around 45 knots, though the version with the Hamiltons lost a little compared with the surface piercing props, but we must consider that we were sailing with a 3/4 sea and, this notwithstanding, were able to write our data on the computer. This yacht behaves impeccably on the waves. We pressed her on, doing figures of eight with a suitably narrow turning radius at a sustained speed of around 26 knots, without perceiving even minimum hesitation or anomalous bumps on the hull, and then resumed our course rapidly and decisively. We point out that the Hamilton version sets the hull on the waves in a softer manner than the surface piercing prop version, probably due to the former's lower sensitivity to the not so clean flows that reach the thrust-maintaining elements. Contrary to what many others have said, manoeuvring in restricted waters with the Arnesons, aided by manoeuvring props, is not at all limited to the few: it certainly requires a minimum of confidence, but there is no lack of prompt response. As for low speed manoeuvring with the Hamilton waterjets, this is altogether different. First of all, there is a rotating head joystick on the bridge with which control is absolute and above all extremely intuitive. 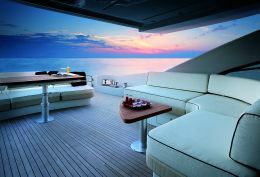 The result is that you can steer a 26 metre vessel with a truly extraordinary simplicity. Another point in favour of waterjet transmission is undoubtedly the greater sailing comfort, the silence and the absence of even the minimum vibration. This is due to there being no immersed rotating elements and can be appreciated even at slow speeds. It should also be said that the soundproofing developed by the yard ensures, in both cases, a really high level of comfort even at the highest speeds. 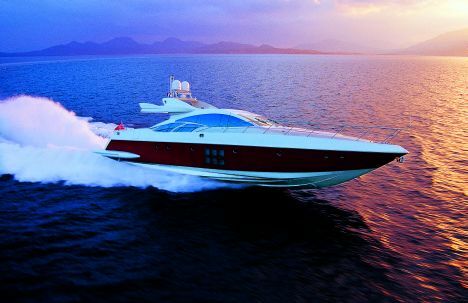 For this 86 footer Azimut has taken the tried, tested and much appreciated lines that immediately distinguished the firstborn of the Azimut 68S line. This super open also displays stylistic elements that have become the trademark of the famous architect Stefano Righini, such as for example the six square windows in the bulwarks amidships, or the windows in the superstructure which repeat the shark's fin form that recalls those of the Asimut fly series, this last a solution with the twofold function of slimming down the profile and offering the interiors a lighting otherwise unobtainable. 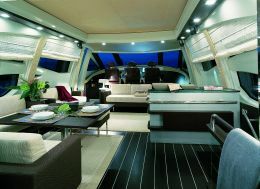 The superstructure, in GRP like the hull, is spacious and houses the saloon and the modern and complete bridge from which all round optimal vision is guaranteed by the precise positioning of its three leather chairs. In just a few seconds this enclosed area can be opened up, electrically controlled, its ceiling disappearing into the cockpit covering. The interior layout was developed and supervised by the architect Carlo Galeazzi who has favoured wood and facings that make each environment bright and modern. The lines are essential and the material used for both floors and furniture is wenge, with inserts in broadloom for the former and aluminium for the latter. 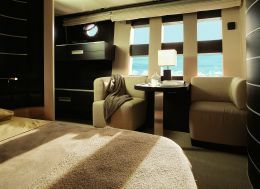 The saloon also contains the companionway giving access to the galley and the crew area on the lower deck where we find the mess, two single cabins with a second foldaway bed and a complete bathroom. But having entered the interior of the yacht we must necessarily pause for a moment at the owner's cabin which is developed along the whole breadth of the amidships area and illuminated by six windows overlooking the sea on each side. We spent some time under way in this cabin, at high speed and with a sea running. Not only could we speak in a normal tone of voice but also, more surprisingly, remain calmly standing to admire the spectacular view. 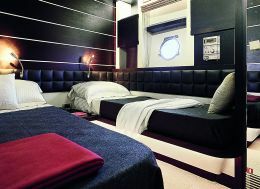 There are three guest cabins: a double-bed VIP cabin forward and two with twin beds. They all have private bathrooms and give onto a shared lobby. Externally the Azimut 86S offers plenty of space for relaxation in the open air, starting from the spacious swim platform aft, an actual little beach, from which the cockpit is reached by way of two handy lateral stairways which frame the spacious sundeck in this area. In the centre of the cockpit there is a table which on one side exploits the seating level of the forward edge of the sundeck, with backrests obtained by moving a part of it, while special chairs serve the other sides in order to have a dining table that seats eight. The forward area of the cockpit has an L-shaped sofa with coffee table and, opposite, another sofa set fore and aft. Between the two sofas, the two large glass sliding doors which open to a total width of 1.40 metres to give access to the saloon. Special mention must go to the great technical job done by Azimut in developing and achieving the initial objectives of the design: reduced weights, light displacement and avant-garde plant and systems. To obtain all this they employed modern building techniques and materials such as Kevlar and carbon fibre. Though this yacht is most suitable for fast, comfortable cruising, its sea-kindliness under all conditions makes it a vessel that arouses the desire to go to sea even if there's only time for a swim or to enjoy lunch a few miles from the coast.